We got a lovely storm over the weekend, but evidently I have not gotten over my city girl driving outlook. I had plans to head into Fresno yesterday to visit with some friends, but ended up canceling because I wasn't altogether comfy with driving up over Deadwood or even taking various alternate routes. I felt not so much like a total wimp about when I found out that the other two ladies that live in my area who were going to go to the get together also refused to drive over the pass. We did have enough of a break in the rainstorm yesterday to get out for a nice walk, not a strenuous one although we were out for a couple of hours. We headed down to the river which is always fun to see all the water in it after a good rain. Dino had tempted me out of the house with a promise of seeing the Dipper, but unfortunately said bird decided not to cooperate. We did see a large group of horses (17) on our Northwest Territory and spent some time doing scratches and conversation. Our place is at a low enough elevation that we did not get snow, but the hills just above us did, which made for a postcard pretty view. 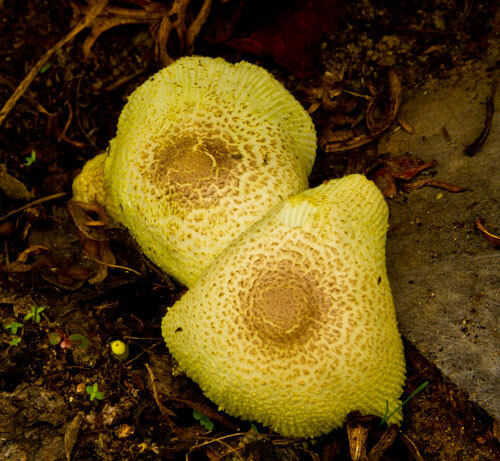 Incredibly enough, the rain triggered a zillion or so fungi to pop up, including a couple of varieties that I haven't photo-d before (heh heh). 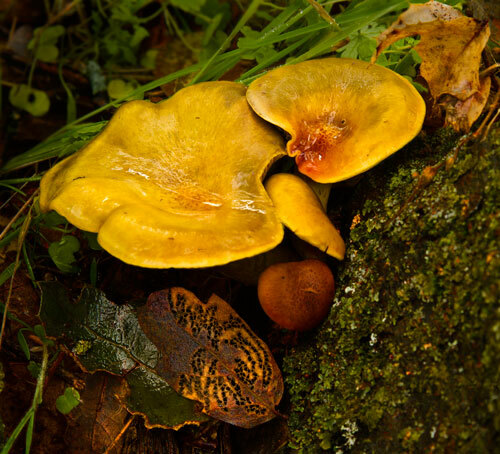 Including this one, the Jack-o-Lantern mushroom, Omphalotus olivascens, which is bioluminescent, i.e. it glows in the dark. Cool! 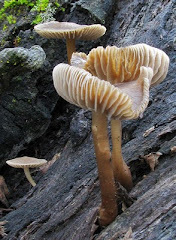 Also evidently if it is eaten, it makes you sick (ugly gastrointestinal upset) but doesn't seem to kill you and, according to this mushroom web site, is hallucinogenic which supposedly is a plus for some, although with possible eruptions from both ends, I dunno. Being well past my experimental early college years, I'll just take their word for it. Dino noticed this hummingbird before the praying mantis did - this bird had evidently perished while securely perched on the fence wire. Its little feet were still clamped shut and held the bird pendant. Ever of a scientific bent, we left it. Some days after its demise, along came a hungry praying mantis. 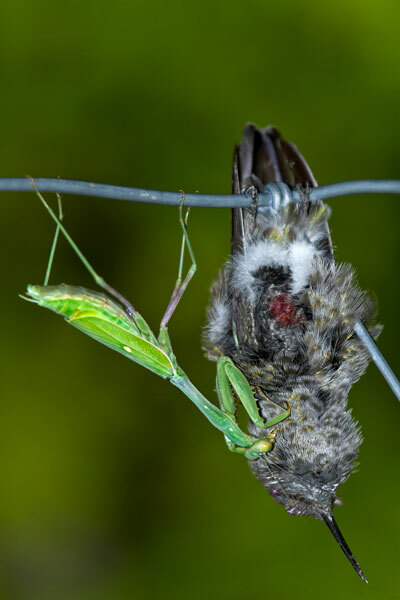 We did not know that mantises would eat carrion. We are still feeding huge swarms of hummers. Dino has been tracking the number of hummingbird feeders we fill, and determined that in the month of October we put out forty two gallons of hummingbird nectar (1:4 sugar water solution). This represents a 50% increase in hummingbird food over the months of August and September. Using a calculation of 500 birds/gallon/day, we figure that we are feeding 677 hummers/day. On heavy days, we can easily see 50 or more birds at a time. I'm not sure where Dino originally found that calculation, but the website Field Guide to Hummingbirds repeats a similar one: "One fluid ounce of 1:4 sugar water weights about 35.5 grams (approximately 20% more than its plain water counterpart). We'll average the weight of the birds to 3.5 grams, or about 10% of the weight of a fluid ounce. Multiply that times by 265% for average consumption and we get 0.265 fluid ounce of 1:4 feeder solution per bird per day, which we'll round down to 1/4 fluid ounce per bird per day. This multiplies out to around 32 smallish hummingbirds per 8 ounces of 1:4 sugar water, 128 per quart, and 512 per gallon." Since Anna's hummingbirds are somewhat larger than "smallish", using 500 birds/gallon seems reasonable. *Note - the author of the blog noted wrote the Peterson Field Guide to Hummingbirds book, so believe her info to be good. 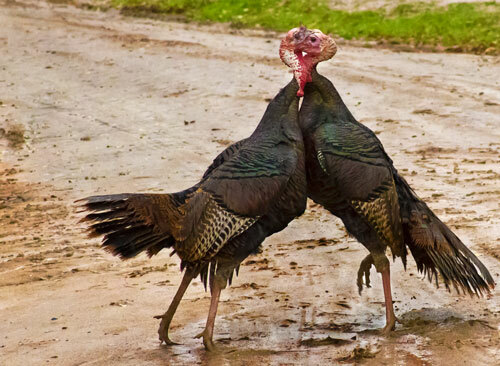 Yesterday, as I returned from a town trip, I pulled into a driveway that was doubling as a wild turkey battleground. Two males had engaged in battle and were so intent on their contest to establish dominance that they were in some sort of alternate universe - they paid me no mind as I stood there watching, mouth agape. After a minute or two of watching, I rushed inside to make sure Dino saw what was going on. Turned out he was well aware and that the battle had already been raging for well over an hour. He'd been photographing and was only inside to grab another type of flash unit. Neither male showed any signs of backing down - they were using their beaks to grab the head of the other combatant and then twist the neck into horrible-looking contortions. Occasionally, one would seem to get the upper hand, forcing the other into a corner (against the fence) and then the tide would turn again. As dark fell, they were still at it. We don't know the outcome - there were no turkeys about the place this morning (no carcasses either that we know of). As we were reviewing the photos, I admit to feeling a tad icked out by the mess they were making of each other. This is not at all one of the most gruesome looking pics. Subsequent research found this charming quote: "Turkeys also spend a lot of time establishing a pecking order in the flock during the fall which means there is a lot of fighting going on between birds to find out who is more dominant. This makes fighting purrs especially effective calls in the fall because not many turkeys will turn down a good fight" from The Wild Turkey Zone website, unfortunately a site devoted to turkey hunting. Of course, we understand the concept of "pecking order", we'd just never SEEN anything like this. We had a lovely time hosting house guests from the Bay Area last weekend - don't we both just love showing off our paradise! Not to mention enjoying the wonderful company and (of course) ye old food and drink. The oldest quince tree on the place - we have another planted not even a year ago that is not mature enough yet to bear fruit - took a bit of a rest this year and gave only about twenty or so fruits this year. I was determined not to let a single one go to waste. Last week on one of my days off work, I made membrillo, a very sweet quince paste/preserves number. And, as I was pondering what else to make that didn't involve quite so much sugar, this month's Vegetarian Times arrived with The Answer: Quince and Vegetable Tagine. In a shocking departure from precedent, I am posting the recipe on this blog. Note: the original recipe calls for 2 small fennel bulbs which I detest so I left them out. If you want to use it, they go in with the cauliflower and zucchinis. Also, the chickpeas were something that I added to make this more of a main dish than a side. The original recipe called for 3 cups of water, but I found that to be too liquid-y so 1 or maybe 2 cups would work better. Combine cumin, coriander, turmeric, ginger and cayenne in small bowl. Set aside. Drain tomatoes and set aside. If using whole tomatoes, slice in half. Transfer juice to small saucepan. Stir garlic, 2 tsp sugar, 1 tbsp of the cumin mixture and 2 cups water into tomato juice; bring to a boil Reduce heat to medium-low and simmer 15 minutes. Combine 2 tsp sugar and cinnamon on plate. Coat cut sides of quince pieces with cinnamon sugar. arrange quince skin-side down around sides of roasting pan. Sprinkle remaining cinnamon sugar and remaining 1 tsp sugar over vegetables, and cover with foil. Reduce oven heat to 350 F and bake 1 hour, or until quince and vegetables are tender.